Some time ago, I promised a tutorial post on pin stitch and now it’s time to address this question. In my humble opinion, few machine-made embellishments for classic clothing have as much aesthetic impact as the most common hemstitches, pin stitch and entredeux. So, for those of us who love to create such garments, it is important to know about these two machine made hem stitches. Since this is a very broad topic, this post will deal only with pin stitch. As a matter of fact, it will take two posts for pin stitch. Some time later, I will talk about entredeux. 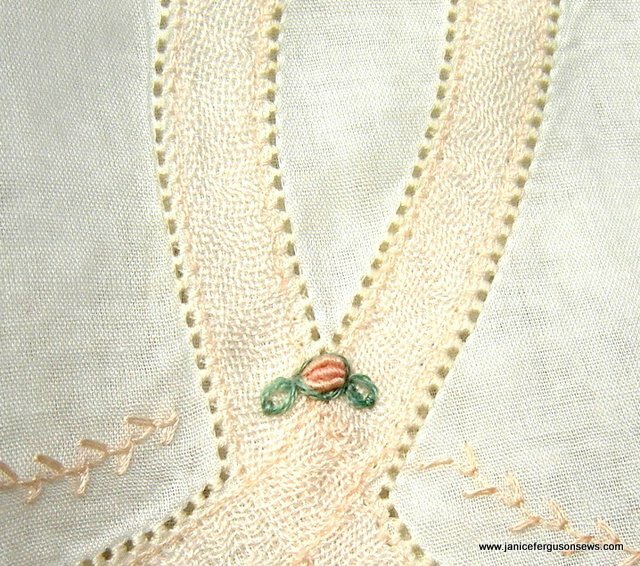 Also known as point de paris and Parisian hem stitch, is a stitch made by both hand and machine. This discussion deals only with machine made hem stitches. First let me give you a brief overview of this stitch. 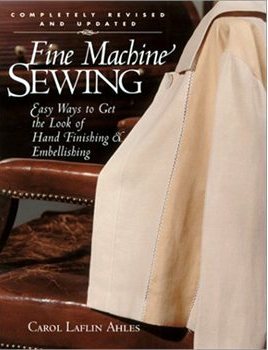 Much of this information is taken from Carol Ahles’ excellent reference book, Fine Machine Sewing. DESCRIPTION: Pin stitch is described by Carol as a stitch pattern that resembles the letter “L” (or when mirror imaged, a reversed “L”) repeating the vertical stitches and on some machines, the horizontal stitches. It looks like this in the machine stitch menu. On several machines I have used, this requires 8 stitches for each hole, which appears at the left end of the horizontal stitch. A good starting point for settings is W. 2.5 and L. 2.5. Don’t be tricked into using a stitch that has two horizontal stitches. Those are usually for applique’ and will not give the same look as a genuine pin stitch. It looks like this on fabric, shown here on a lace tape Wedding Ring dress. The pin stitch is worked around the lace tape, attaching it to the fabric. CONSIDERATIONS: There are several factors that come in to work a pretty pin stitch. These factors include selection of fabric, needle, thread, trims, preparation and presser foot. 1. Fabric~greatest success is achieved by choosing a 100% natural fiber fabric, though silk is not a good choice. Linen and cotton are most commonly used. Blends, even lovely Imperial batiste, are just not suitable for most hemstitching. I once was determined to pin stitch lace tape on an Imperial batiste Chery William Lacy Bishop doll dress. Ultimately, it looked pretty good a long as the doll was lying flat. So much starch was required that the dress was as stiff as cardboard. When it was laundered, the puckers looked like one side of puffing. It was a baaaaad choice. 2. 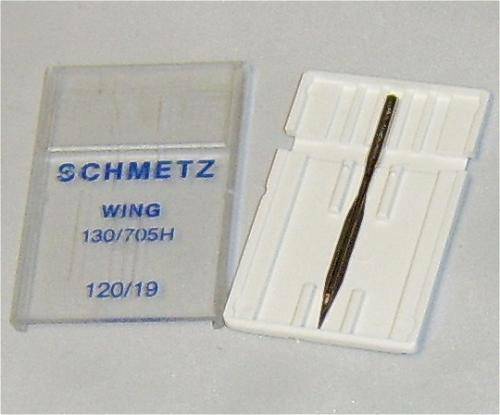 Needles: The most common needle choice is a wing, which comes in two sizes, #100 and #120. Other common choices include #100 sharp or a #90. Keep in mind that the size of the needle determines the size of the hole created with this stitch. I love the big, showy holes of the 120 wing. But on baby items I often choose a #90. On doll dresses, I have used needles as small as #60, though #80 is more common. If your goal is to emulate handwork, you should strive for smaller holes. Compare the size of the hand worked pin stitch on the iris placemat and the shadow work collar to the examples of machine pin stitches. Hand worked pin stitch. 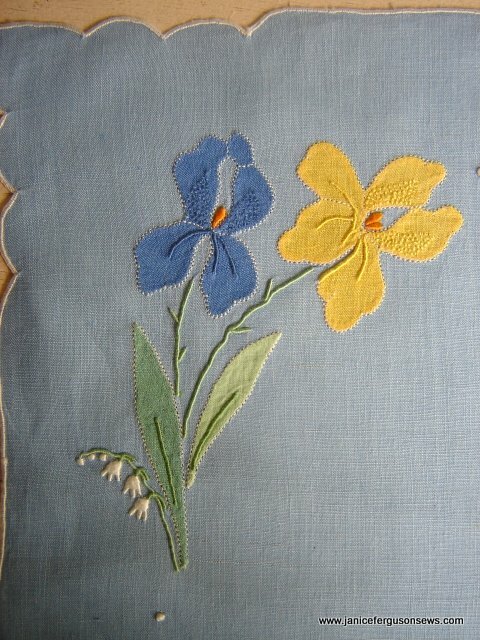 Usually with Madeira applique’, the thread color matches either the foundation fabric or the applique’ piece. 3. THREAD: Fine thread needs to be used. Think about the fact that you are punching a hole in fabric and pulling it open with thread. It’s likely that there will be 4 threads in that pretty hole which you want to see. Heavy thread will fill it up. My thread of choice is Maderia Cotona #80. 4. TRIMS: This is where it gets tricky. You sometimes have to select the needle that will suit your trim. Most lace is fine with a wing, but some dense or delicate laces might be cut by the spade-like shape of the wing needle. In those cases, you would be wise to choose a sharp needle rather than the wing. Tatting is especially worrisome, because a cut there is very, very hard to mend and reckless to ignore. It will come unraveled. 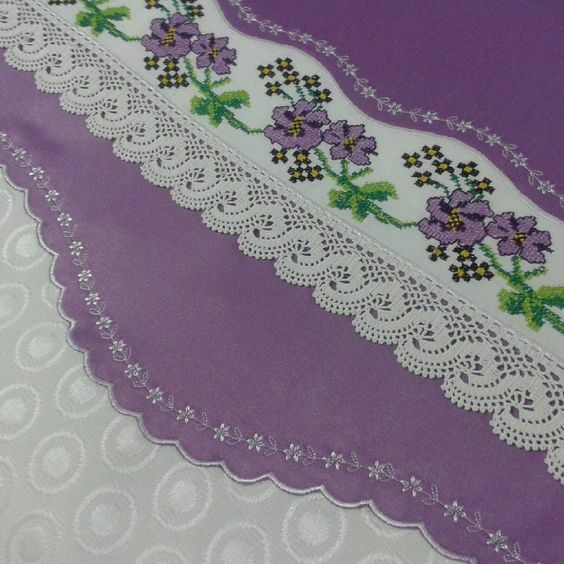 I have found one pattern of tatting that relatively safe from damage when pin stitching. Notice how the greater part of the pattern is away from the crochet cord to which the tatting is attached. It was successfully (and carefully) joined to the perimeter of this 20″ table topper. That amounts to 80″ without a cut. 5. PREPARATION: fabric~Heavily starched linen or cotton can usually be pin stitched without stabilizer. 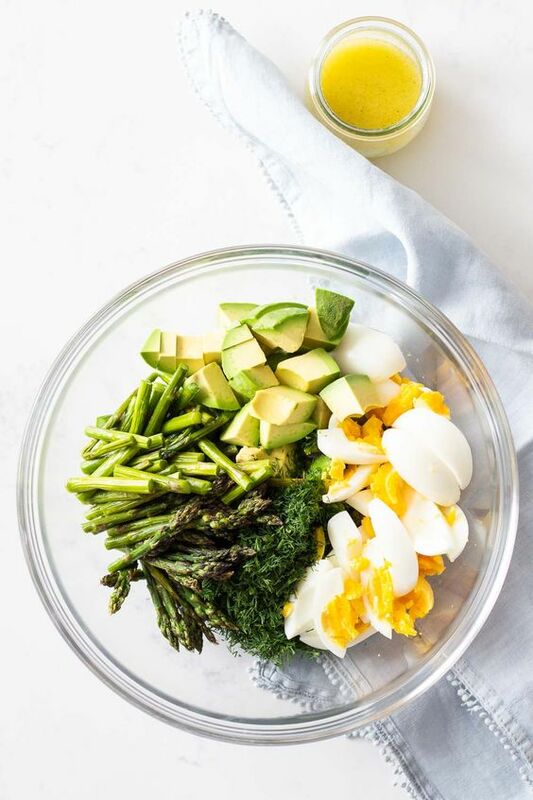 Always, always rehearse your settings on the exact fabric, preferably with the same grain line, with the exact amount of starch before you begin. I usually press a scrap from the project and if I am joining lace, I set it up in the same manner as the project. Then I begin, taking care to record the settings with a pen next to each trial on the scrap. 6. PRESSER FOOT: All my sewing machines have told me to use a foot which helps control a forward & backward stitch pattern. On my Brother machines it is the “N” foot which has a clear plastic window so you can see fabric as it approaches the needle. But still I have much better results when using an open toe foot. None of the control the “N” foot gives me is worth the visibility I get from the open toe foot. Try the recommended foot and then try an open toe. Choose the one that works best for you. To be continued: What now? Actual nitty gritty needle/thread to fabric how-to and applications. 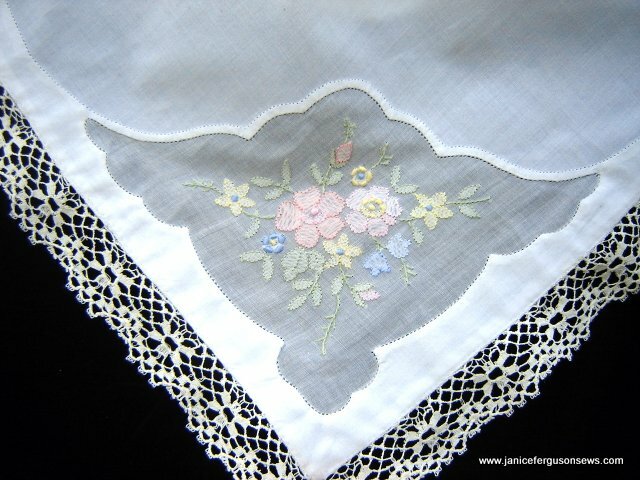 This entry was posted in heirloom sewing, techniques, Tutorials. Bookmark the permalink. Great information……have been waiting for you to address this subject. Keep talking, I’m listening with both ears!! I LOVE this subject! Thank you, Janice. This is fabulous! Looking forward to part 2! Thank you, thank you, thank you! I have read Carole Ahles’ book, but there really is nothing like a good tutorial. Thank you so much for your comments on this post! I was a little concerned that only Lindsay (who asked specifically) would find this topic of interest. I really, really appreciate your input and positive replies. Thanks so much Janice, I really enjoyed your tutorial on this subject. I also have Carol’s book; I like your info. Thanks. Great information! I’m new to doing all this fancy work on a machine and just found your blog through Totally Tutorials. I’ll make sure to add you to my bloglovin’ and keep up with this post. Thanks! Ooooh I didn’t know you could do this on a machine, I shall have to experiment! Tanny, I’m glad this tutorial caught your eye. I hope you give it a try–pinstitch is such a useful technique. Thanks for writing. Alexandra, so many machines include this stitch, but you need to know what to look for. Often, for those without it, there are ways to simulate the look. Let me know if you have any questions. I love this very useful technique and think you would too. Thanks so much Janice, I have been “collecting” some beautiful fabric to create some special skirts for my Granddaughters and I just the finishing technique I have been looking for! Ronda, I am so glad this tutorial was helpful. 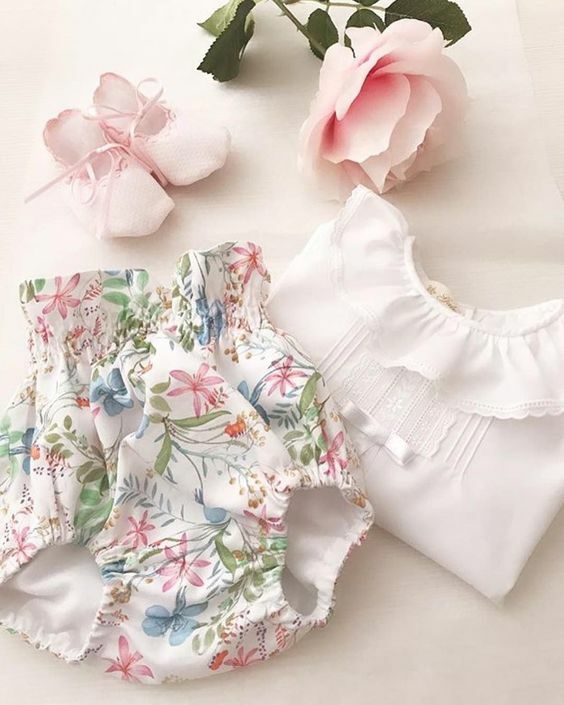 Sewing for granddaughters is such a joy. I’d love to see photos of your skirts with pinstitch. of both? I would appreciate a reply. L. Cross, your fine bobbin lace must be exquisite! I had a weekend with lacemaker Robin Lewis and was awed by the beauty of handmade lace. I’d love to see yours. For more detailed instructions on pin stitch, go to Pin Stitch Part II, If this does not answer your question, please write to let me know. I’d be happy to help in any way that I’m able. Janice this tutorial is superb & is one that is very unique as no one else bothers to explain the details of these type of stitches which will create awesome Heirloom projects. Just because this type of stitching that was very popular in my grandparents day ,is from the older generations , the attitude in modern day sewing now is not to do it as it for the oldies only . I get so much enthusiasm in reading all of your projects & the sewing info that you post . God bless you in all of your gift projects & what a great attitude you have in getting the younger generation to sew . I have contacted you before & I thank you for your generosity in replying to my Heirloom work enquires . I need now to put it all into practice. Coral, thank you for your wonderfully warm, encouraging comments. I’m so glad the pinstitch tutorial was helpful for you. 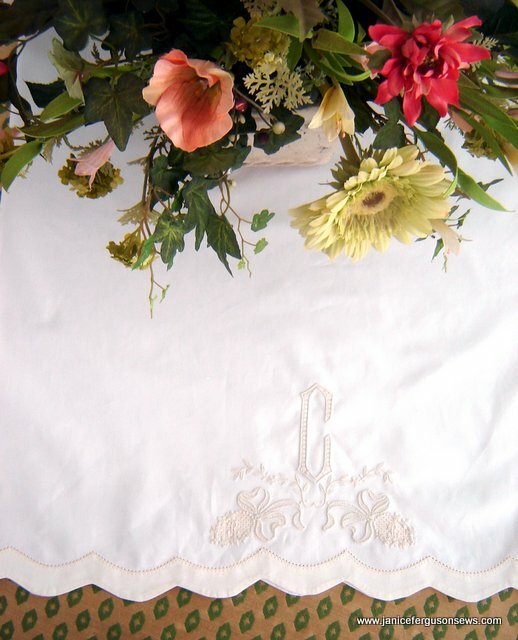 This technique is one of my favorite embellishments and I think it is as suitable and pleasing now as it was in your grandparents’ day. Congratulations on your ownership of Brother’s Quattro–what a fabulous machine it is!!!! I’d love to come to Australia again. I made two trips across the pond to teach in the Blue Mountains at seminars in Blackheath. I love, love, loved it. But now I am too wrapped up in spending time with and sewing for my precious grandchildren to venture any further from home than they are! But what wonderful memories I have of your country and the delightful ladies I met there. Hi, Does anyone know what foot should be used on a Berninia machine? Dana, I am not familiar with Bernina foot numbers. But my preference has always been the open toe foot. For me, visibility is very important with this stitch. I hope you find the foot that works best for you. Thank you so much for the wonderful information. I now feel like I would like to try pinstitching. I appreciate the “voice of experience” included. Pam, I am so glad this information was helpful. Just put that wing needle in, thread up with fine thread and give it a go on natural fiber fabric! 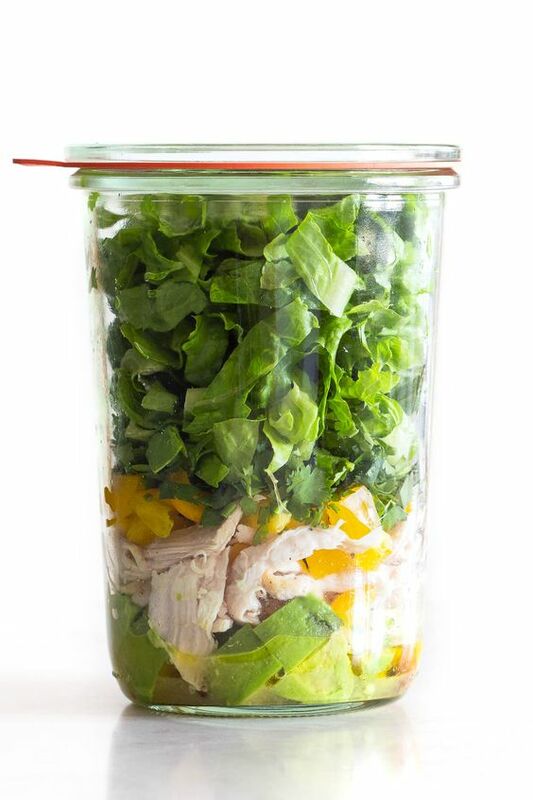 The results are so gorgeous that it’s worth a little practice. Please let me know how it goes for you. Janice, I too am in Australia, but I am out in the bush. I found your tutorial on Pin stitching by accident, and it is perfect. I am making an Edwardian Christening Robe, and this tutorial is just what I need. I will try and find part two. I did not know about wing needles, but I hope to go into town in the next fortnight and will try to get one then. I have a Semco machine without too many frills, but it does sew nicely. Thank you so much. Lyn. Lyn, I’m so happy that you found the pinstitch tutorial helpful. When you first use a wing needle I think you will be amazed at the possibilities. So many stitches–in addition to pin stitch–are enhance by the use of this specialty needle. I hope you find part 2 useful. I’m certain your Edwardian Christening Robe will be lovely. Please share a picture if you will. I’d love to see it.